There are many theories as to why Thomas Edison was more popular that other inventors of his generation. There is an overwhelming abundance of conspiracy theories on the internet claiming that Edison cheated his contemporary inventor Nikola Tesla out of fame and fortune. Some of the wild stories would have you believe that Edison was the devil. As far as any conspiracy of why Edison is more popular than Tesla, it doesn't take a genius to figure it out. Nikola Tesla was fascinated with AC power (alternating current), he is most famous for working with George Westinghouse in the development of AC power distribution. For much of his life Tesla worked alone in laboratories on experiments with alternating current. Edison was popular in the media of his day, and he introduced the world to devices that played music and movies. Thomas Edison was an entertainer who promoted cool toys that entertained the world. 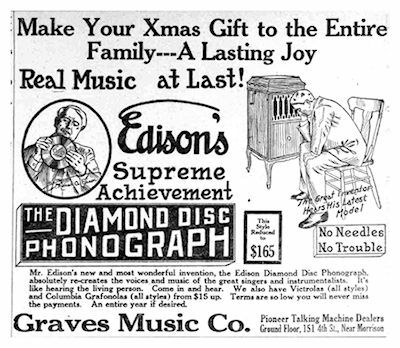 In a world long before the internet and television existed, Edison brought us music and movies. At a time when the world was changing rapidly as the industrial age was introducing new technology to everyday life Edison created the image of the mythical inventor. Edison wasn't working in some cold boring laboratory, he used his image as the great American folk hero to tell people he was creating an invention factory. One of the first things created in his invention factory that would make Edison the rock star of the late 19th century would be the phonograph. The first invention of the phonograph was in 1877 while Edison was hoping to create a machine that would transcribe telegraphic messages through indentations on paper tape, which could later be sent over the telegraph repeatedly. Edison made a name for himself as the inventor of the phonograph giving demonstrations of his famous talking machine to the president and the US Congress. Becoming a legendary larger than life folk hero of the 19th century, Edison was dubbed the Wizard of Menlo Park. The lives of Nikola Tesla and Thomas Edison, and the people they interacted with during their lifetimes, is an interesting story in defining a geek. Nikola Tesla and Thomas Edison were two of the most prolific inventors of the twentieth century. Tesla came to America looking for Edison and hoping to earn his respect, and show him his inventions in the field of AC (alternating current). The arrogant Edison brushed away Tesla as an intelligent man with ideas that weren't practical, because Edison favored the competing system DC (direct current). Tesla, jilted by Edison, would go out on his own to prove his point. Years later Tesla would team up with Edison's rival, George Westinghouse, and together they would defeat Edison in a great science and technology feud known as The War of Currents. In the battle of the two crazy mad scientists, Tesla would be the ultimate victor in the battle of good versus evil, defeating his rival, Edison. Much of what is said is exaggerated for the sake of a good story. The myths and legends grow stronger every day on the internet. Many history books and museums tell us Thomas Edison was greatest inventor of all times with a thousand different patents for a variety of inventions. Nikola Tesla has become a modern day cult hero on the Internet. In researching Nikola Tesla you will find many people who are fanatics in their extreme zeal to promote the legendary stories surrounding the legacy of Tesla, claiming Edison and others took credit for many inventions that were created by Tesla. The goal of Geek History is to be fanatic at finding the truth. There are so many myths and legends about Tesla, we could write an entire chapter of debunking all the misinformation. For the sake of setting the record straight in the battle of Edison versus Tesla we though we needed to at least address some of the major points of misinformation and put some things into perspective. The often quoted myth states that Tesla died in 1934 a broke and broken old man because Edison stole Tesla's ideas. The statement becomes the mantra to make Tesla the patron saint of geeks and a martyr. The statement perpetuates many myths about the life of Tesla being one of hardships and failures. Without a doubt Nikola Tesla was one of the most interesting geeks that ever lived. 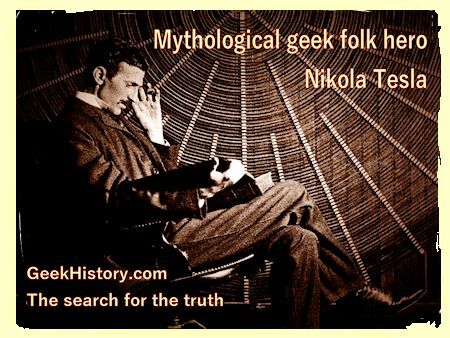 The passion for Tesla by his fans and the stories about Tesla's scientific accomplishments has elevated Tesla to the status of mythological geek folk hero. When the names of Edison and Tesla come together it appears that some people look at their relationship as a life long battle. Their great feud over the use of AC (alternating current) versus DC (direct current) known as the War of Currents lasted only about a decade. Tesla's career went on for many more years beyond his battles with Edison and the War of Currents. At times the life story of Nikola Tesla flows like an epic science fiction saga. According to legend, the man known as the Master of Lightning was born at the stroke of midnight on July 10, 1856, during a lightning storm in a mountainous area of the Balkan Peninsula. The area of the Austro-Hungarian Empire where Tesla grew up is the modern-day country of Croatia. Tesla's parents were Serbian, his father was an orthodox priest, his mother was an inventor of practical household gadgets. The stories of Nikola Tesla growing up tell of a young man constantly craving knowledge. He had a powerful imagination and a photographic memory. 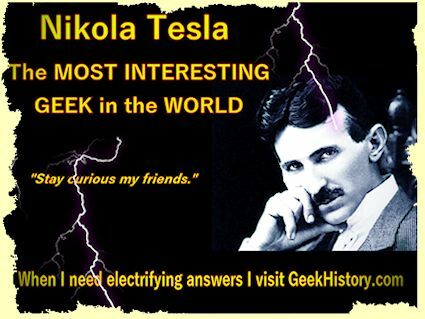 Tesla was always the geek growing up, he learned to speak 8 languages and was known to recite books from memory. According to popular stories Nikola Tesla's dream to go to America one day also started when he was young. Upon seeing an engraving of Niagara Falls, Tesla told his uncle he would someday capture the energy of Niagara to produce electricity. There is even a good story to explain how Tesla would go to college. Tesla's father expected young Nikola to follow in his foot steps and become a priest. Nikola was passionate about mathematics and science. At the age of 17 Nikola Tesla had a brush with death from Cholera. While on his death-bed from Cholera, Nikola was promised by his father he could go to college to study science if he survived. Nikola made an amazing recovery. He went on to study electrical engineering at the renowned Austrian Polytechnic School at Graz.